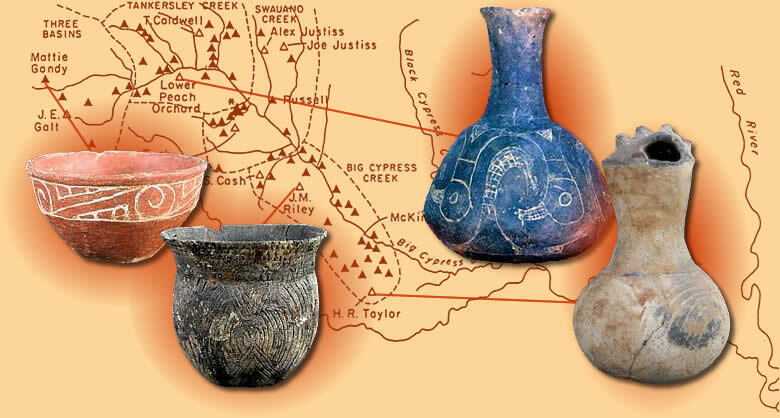 The Caddo Indians were known as builders of large burial mounds. Legend has it that they spoke of a "Pleasant Mound" in the central part of what is now Titus County. It is believed that the early Anglo settlers modified this Caddo name and referred to the broad, oak and hickory-covered hill as Pleasant Mount. When Titus county was organized, the small village that would become the seat of government was given the name Mount Pleasant. In 1850, the little town on the hill had a population of 227. One thing that contributed to attracting settlers, and especially merchants, in the early years was the Clarksville-Jefferson Road, which passed through Mount Pleasant. Established by Andrew J. Titus, for whom Titus County is named, this road made possible the movement of goods to and from Jefferson, which at that time could be reached by riverboats. Even with the road, it is said that the trip to Jefferson by ox wagon required at least five days. The Martha Laird Chapter was organized on November 14, 1942. The name Martha Laird was selected in honor of the great-great-grandmother of the Organizing Regent, Zenobia Slaughter Lide (Mrs. Dean Lide). Martha Laird came to America with her brothers and sisters in the early 1730's on board the same ship with Samuel Harris, who became her husband soon after landing in Pennsylvania. Later they moved to North Carolina and then to Greene County, Georgia. Samuel Harris gave civil service in the American Revolution and all eight of Martha Laird Harris' sons and her three sons-in-law served in the war. Martha Laird Chapter is in Mt. Pleasant, Texas. The Chapter meets the second Saturday of each month at 1:30 p. m. except for the month of May. At that time the chapter meets on the third Saturday. For chapter contact or membership information, contact us. Contact Webmaster for problems with this site.